Envy Code R has been updated since this post. I have been experimenting with Envy Code R over the last few months – everything from creating a bold version to delta hinting with Visual TrueType with mixed results. Part of the problem is that at larger sizes the odd shapes and over-emphasized curves that I drew to make the font look great at 10-point with ClearType on makes it look awkward at larger sizes. Let me know your thoughts in the comments, even if it’s just to say your prefer PR6, Consolas or something else. Be sure to mention what size and whether you have ClearType on (or if you are using a Mac). The primary difference is that Microsoft try to align everything to whole pixels vertically and sub-pixels horizontally. Apple just scale the font naturally – sometimes it fits into whole pixels other times it doesn’t. This means Windows looks sharper at the expense of not actually being a very accurate representation of the text. The Mac with it’s design/DTP background is a much more accurate representation and scales more naturally than Windows which consequently jumps around a lot vertically. Jeff and Joel both wrote follow up posts agreeing that it is one of philosophy but both are of the opinion that the Windows pixel-grid approach is the better whilst our displays are only capable of low dots-per-inch (DPI). What they don’t seem to appreciate is the compromise this causes. Neither of these may matter to a casual user but for professionals preparing material destined for high DPI (film or print) then it’s a world of difference. How can you layout a page on-screen and expect the same result on the page when the font isn’t the same width? The issue is reminiscent of the “I hate black bars on wide-screen films” brigade who believe that the film should be chopped, panned, scaled and otherwise distorted from the artists original intention simply so that it fits better on their display. Typography has a rich and interesting history developed and honed over centuries. It is a shame to misrepresent typefaces especially as the pixel-grid approach becomes less relevant as displays reach higher resolutions. Some additional comparisons and a note that the gamma differences between Windows and Mac will affect how you see the “other” systems rendering on your machine. George thinks the philosophy idea is wrong because “What percentage of Mac users sit around all day doing nothing but pre-press work?” but as Fred points out Microsoft’s desktop-user optimized rendering ends up on images and videos all over the web, thus escaping the environment for which it was crippled. George also claims that Vista’s rendering is improved, I can’t vouch for that one way or another but from looking at his screen shots the difference there could simply be the contrast level as adjusted by the ClearType tuner. Nathaniel believes that it’s not Microsoft’s job to manipulate a typeface and that if you want on-screen readability then choose a font designed for that such as Microsoft’s own Tahoma or Apple’s Lucida Grande. 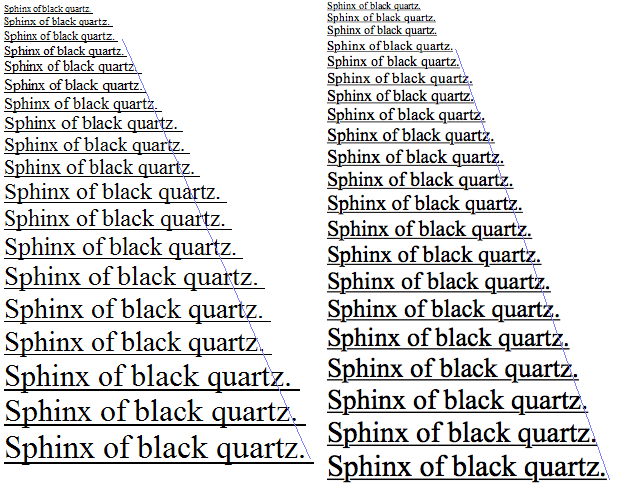 James points to an article called Texts Rasterization Exposures that proposes a combination of using vertical hinting only and calculating horizontally to 256 levels and has some convincing screen-shots showing the benefits. Probably too late for Leopard or Vista SP1 though. Linux vendor Red Hat have released a font family named Liberation under a GPL license. The family consists of three typefaces known as Liberation Serif, Liberation Sans and Liberation Mono each in normal, italic, bold and bold italic variants. The fonts are not hinted in this initial release so may not look too great on-screen at some sizes. Red Hat expect to release better-looking hinted versions in the future. Having attempted hinting Envy Code R font myself they have my sympathy. These new fonts are designed to be metric-compatible (and therefore interchangeable) with the standard Windows fonts of Times New Roman, Arial and Courier New intending to “Liberate” documents from Microsoft’s fonts. Bearing in mind Office 2007 pushes new typefaces as the default I’m not sure how successful this will be long-term. 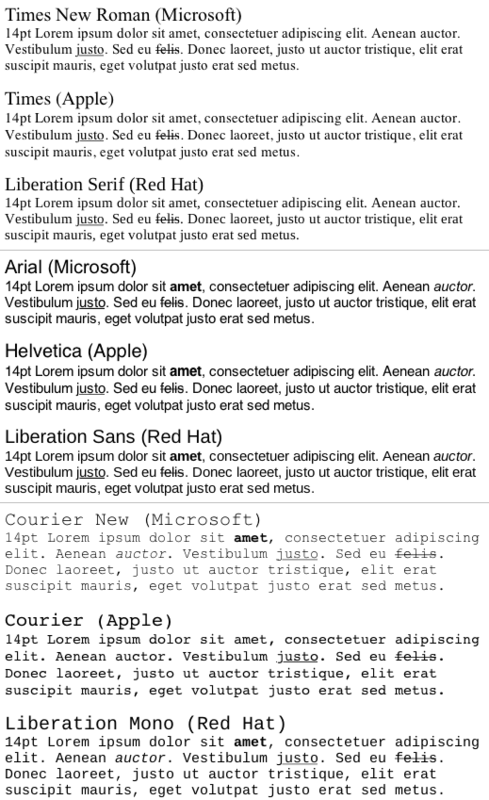 Microsoft’s typefaces were designed to be metric-compatible with the classic Times Roman (1931), Helvetica (1957) and Courier (1955) typefaces in the first place so perhaps Red Hat would have been better off licensing or mimicking those instead. 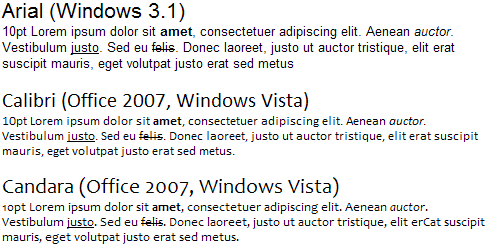 The Liberation fonts on Windows using ClearType alongside the Windows fonts they intend to replace. 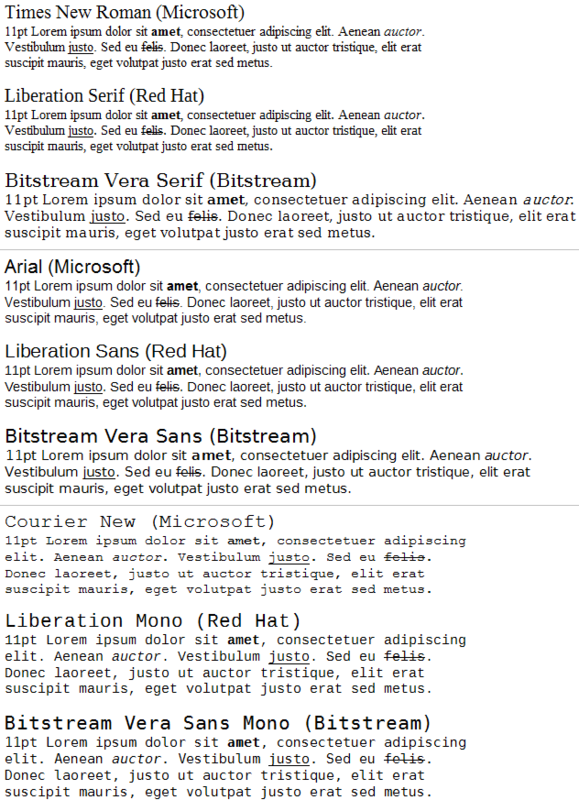 The free Bitstream Vera family equivalent is also shown (only Vera Sans Mono is metric-compatible). 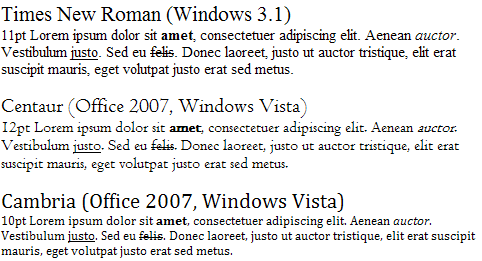 Microsoft’s Windows fonts alongside Apple’s versions of the originals and the Liberation fonts again all rendered with Mac OS X and sub-pixel precision aliasing. Point sizes have been increased by 3pt to compensate for the difference in on-screen DPI. 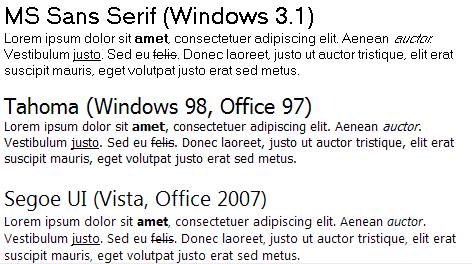 Vista and Office 2007 are interesting as they provide major user interface work that also includes new sets of fonts. I thought it would be interesting to show the evolution of the various styles. 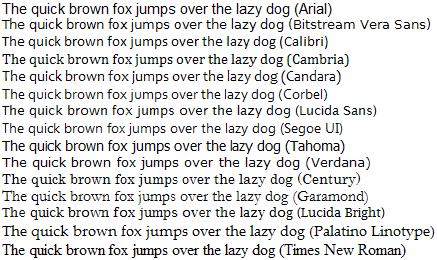 Times New Roman has been the default typeface in Microsoft Word since version 1 and was originally designed for printing newspapers on high speed printing machines whilst still retaining legibility. Curiously enough whilst Office 2007 provides a couple of new serif typefaces the default has switched to the sans-serif font Calibri although a number of the the themes within Office 2007 utilize these typefaces. 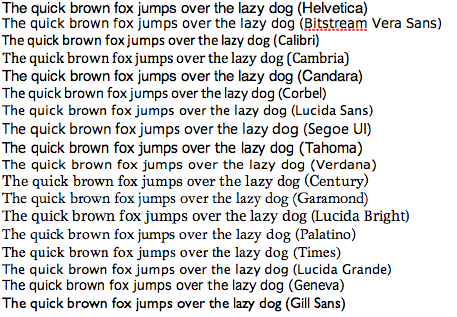 The infamous Helvetica clone Arial primarily used for on-screen document-type work and even used in some applications user-interfaces throughout the years gives way to two new lighter fonts that like most of the new ‘C’ named typefaces rely on ClearType to look legible at small sizes. Calibri is now the default font of choice for Word documents and will therefore probably become a familiar typeface in a short space of time. Primarily used for programming and other environments that require it. At least all those programmers too lazy to try something else will enjoy Consolas as standard in Visual Studio 2007. 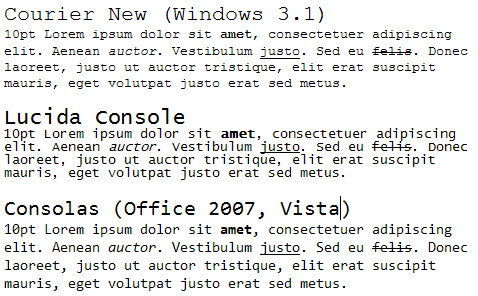 The Windows user-interface switches to a new font once again despite large chunks of the Windows UI never making it past Microsoft Sans Serif (the scalable version of MS Sans Serif pictured below).